It was a deeply moving concert, an unforgettable event. As part of last year’s Easter Festival, the musicians of the LUCERNE FESTIVAL ORCHESTRA, under the direction of the Latvian maestro Andris Nelsons, performed a musical leave-taking for the late Claudio Abbado, who had died in January 2014. The concert is now available on DVD. To start off, they played the first movement from Schubert’s Unfinished Symphony — without a conductor. 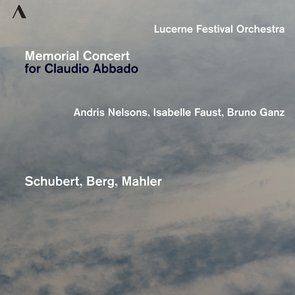 This is the work that Abbado had conducted during his very final performance ever, which took place in August 2013 in Lucerne. Following this, Bruno Ganz recited the poetry of Hölderlin. Isabelle Faust then performed Alban Berg’s Violin Concerto, which is dedicated “to the memory of an angel” and which she recorded with Claudio Abbado in 2011. And to end the concert, they played the final movement from the Third Symphony of Gustav Mahler, whose works had been the focus of Abbado’s work with the LUCERNE FESTIVAL ORCHESTRA. “The emotion that was elevated was incredible; only musicians, only people who are in love with this music, could achieve it,” wrote Peter Hagmann in the Neue Zürcher Zeitung. An overwhelming and deserving farewell with music, with words, and with silence.